It comes in both 32bit & 64bit versions that can boot in both BIOS and UEFI enabled computers. The 32bit version has kernel 4.4.95-noPAE for better compatibility with older hardware while the 64bit has Kernel 4.9.58 for better modern hardware support. True to puppylinux tradition both versions come with a full range of communications, productivity and entertainment applications as well as a wide range of the unique puppy-specific utilities and applications. - JWM window manager and ROX file manager. - Palemoon browser and Claws mail client. - FTP, Torrent and Chat applications. - MPV media player, Simple Screen Recorder and Deadbeef audio player. 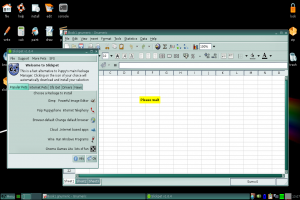 - Abiword word processor and Gnumeric Spread sheet application. - Vector and Drawing applications. - Samba file sharing, CUPS printing and CD/DVD utilities.